Was Your Ancestor an Early Washingtonian? Do you have an ancestor who lived in Washington when it became a state on 11 Nov 1889? 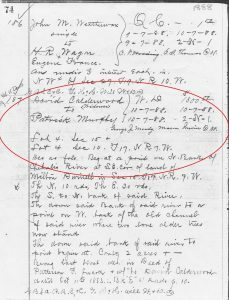 Did he/she come a little later, say before 31 Dec 1900? Patrick Murphy arrived in Washington Territory in the spring of 1888. If the answer to either question is “yes,” then you may be eligible to purchase a Pioneer Certificate or First Citizens Certificate honoring your early Washington citizen. The process is pretty simple. Read the instructions and complete the application, starting with basic information about yourself, then your parent(s) and so on until you get to your first Washingtonian. Then list the evidences of proof linking each generation to the next. For example, I was born in Aberdeen (used my birth certificate). 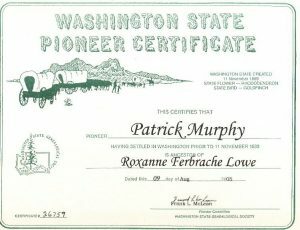 I am the daughter of Patricia Murphy Ferbrache (used her birth certificate) who was the daughter of Daniel Murphy (census record) who was the son of Patrick Murphy who arrived in the Satsop River Valley (Chehalis County, now Grays Harbor County) from New Brunswick, Canada in the spring of 1888. 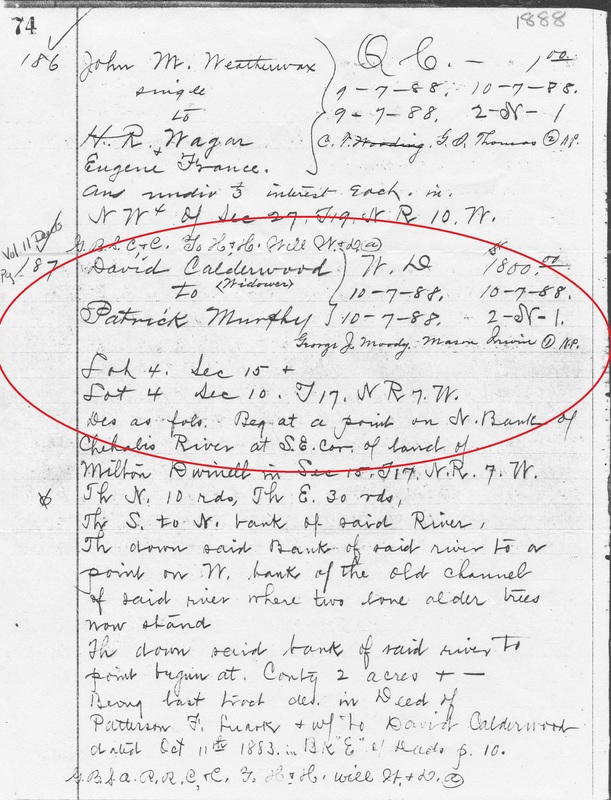 I used a land record (below) showing Patrick purchased land on the Chehalis River on July 10, 1888 — where my 91-year-old mother still lives today. After completing the Pioneer form (same procedure for the First Citizens Certificate), I sent it and my $10 fee to Pioneer Chair Frank McLean. Pretty soon my certificate arrived in the mail. I purchased another certificate later as an auction item at the annual Murphy Picnic — a much sought-after item! The WSGS started the Pioneer and First Citizen Program in 1984 in anticipation of the state’s centennial admission to the union in 1889. While the three printed volumes of names are no longer in print, many libraries (including the Yakima Valley Genealogical Society’s library) have copies. An all-name index is available here. Hint: If you’ve got a Pioneer (here before 11 Nov 1889) or First Citizen (here before 31 Dec 1900), you might check the index to see if a cousin has already done the research! Detailed lineages are available to WSGS members through the Members Only link. A Pioneer and First Citizen brochure is available here. There are a number of resources and aids, including Frank, to help you with your documentation. 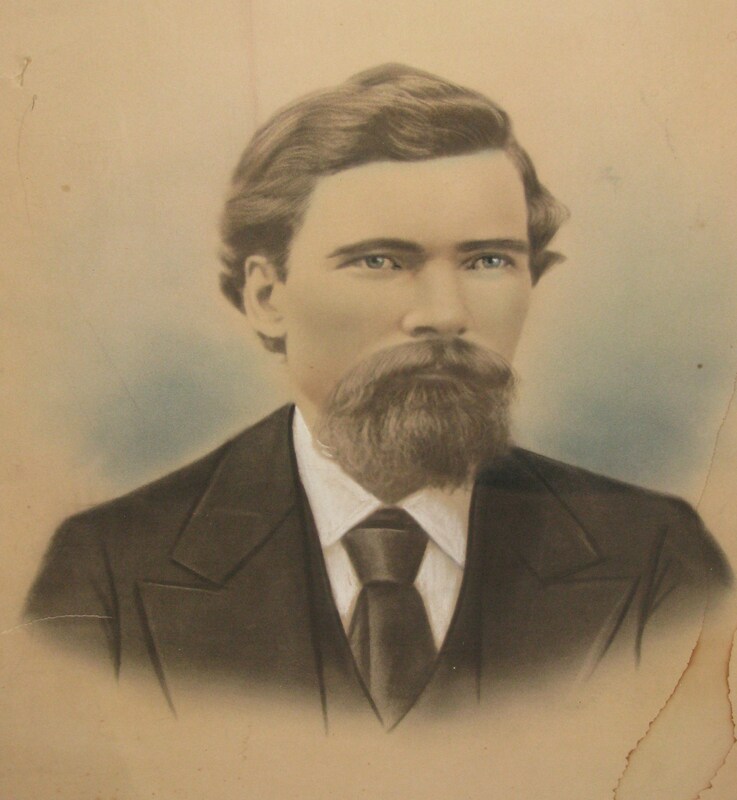 I’m proud to be the great granddaughter of a Washington Pioneer. Join me! This entry was posted in WSGS Programs and tagged Pioneer Program. I have six, have got two done. I guess I need to get on the ball.